There’s been a lot of discussion on the Mellow Bakers forum about semolina versus durum wheat. Please visit over there if you want to join in with the conversation. I am still unsure as to what exactly Jeffrey Hamelman uses when he talks about durum wheat flour or semolina flour even though I have had a good look over on the KAF site to find out. We need a picture of your flour Jeffrey! This is one of the not uncommon challenges of baking from a cookbook written by someone not based in your own country. At the end of the day you bake with what you have, and what you can get hold of and that is how it has been throughout baking history. Immigrants to a new country often use the words from their motherland to describe the ingredients and the breads they make in the new home; often they are different and that is where the confusion arises. In the case of the United States, that melting pot of cultures and foods, this can give rise to breads which bear no resemblance to the European breads whose names they bear. Pumpernickel being the example that springs to my mind. The word ‘corn’ gives rise to all sorts of confusion as does spelt and its European translations. It’s all part of the fun of deciphering the baking puzzles presented to us by writers. I reckon you either like the bread you make or purchase, whatever its name and ingredients, or you don’t. Unless there is legislation to protect bread type names similar to the way it is done in Germany, we will just have to muddle along, carrying on the chatter and trying to figure out the answers ourselves. There is enough argument on the Real Bread forum about what constitutes ‘sourdough’ and I just want to get on and bake great bread and not worry too much about all these definitions. I tackled the semolina bread with liquid levain (one of the June breads for Mellow Bakers) by using this flour. I didn’t put in as much as the recipe stated, as I wasn’t really sure if this was the right stuff or not. I mixed the dough slowly and carefully, the semolo has a very fine sandy quality and this cuts through the strands of gluten in a dough, so over mixing and kneading is not advisable. I then added a further 40 g of bread flour to the mix as it was just too sloppy for me. Once it was well mixed I left it alone. I left the dough for three hours in total covered with a shower cap as usual in a lightly oiled bowl. I nearly always use a light olive oil for this, just enough to coat the bowl, too much and you will get a different sort of texture to the bread. After the first hour and a half, I took the dough out of the bowl and patted and stretched it out into a rectangle on a lightly oiled board and folded it as you would an A4 sheet of paper to go into a business envelope. You then repeat this after turning the dough through 90 degrees. You end up with a nice big squarish mound and you can usually see and feel a change in the dough once you have done this. Stretching and folding dough is an excellent alternative to heavy duty old school kneading. Not that there is anything wrong with kneading, but it’s not necessary to knead for a long time for most breads if you employ this well-known technique. One reason for doing this is to redistribute the developing gas bubbles in the dough more evenly. Looking at the final crumb of the bread, I should have done this twice and then I would have got more consistent crumb in the final bread. I then divided the dough into two parts, and shaped them on a lightly floured board into boules. I left them to stand for about ten minutes, then shaped them again and put them, seamside up into two linen lined and floured bannetons. Once covered, they were left to prove, and were finally baked at 6 pm in an oven preheated to 235º C. They were baked at this temperature for 20 mins on a baking stone, with a small metal tray on the shelf below which had been filled with an inch of boiling water at the beginning of the bake to create steam. The temperature was then dropped back to 190º C for another 25 minutes. Once baked and sounding really nice and hollow when thumped on the bottom the breads were left to cool on a wire rack. The bread improved over a few days, at first I thought it was a bit heavy and I wasn’t very keen on it, but like most sourdoughs they seem to develop in flavour and their texture improves by the second or third day. I noticed that the breads had a fairly low profile, the dough spreading quite a lot before bouncing back with oven spring during the bake. As can be seen the crumb is not very yellow and I think I was probably overcautious and should have used far more of the semola di grano duro more in line with the original recipe in Bread by Jeffrey Hamelman. 235º C gives my breads a fairly thick crust, I usually bake at 220º C but for some reason I decided to follow the exact temperatures that are given in the book, another time I will follow my instincts and bake a little cooler. Lots of other Mellow Bakers have had a play with this one this month. Do visit their blogs and read their posts! Edit: Later in the year I found the right flour! Read about it here. 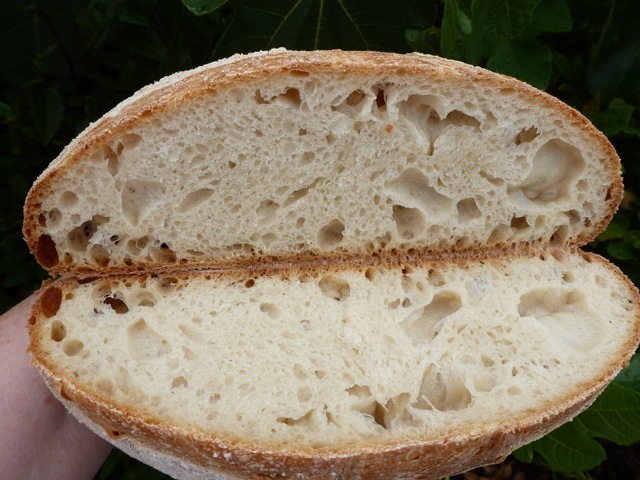 You can see what I baked with the semola di grano rimacinata here – lovely bread! My favourite use for semolina, apart from in Dan’s lovely bun recipe above is for helping the dough not to stick as you move it from place to place. Sprinkle semolina on to your peel or tray before you upturn your dough on to it and you will find it slides easily from there into the oven. This entry was posted in Mellow Bakers and tagged A semolina bread, baking, Jeffrey Hamelman, Mellow Bakers, semolo di grano duro on 29/06/2011 by Joanna. Your loaves are so incredibly beautiful, Joanna. I love the scoring in the top one especially. 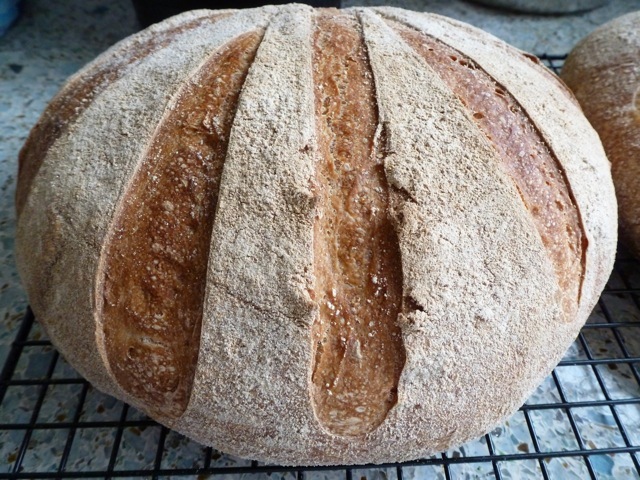 Your comment about them improving with age makes me wish I’d make a bigger loaf, as ours was gone in the first day. Aw thanks Abby, I’m very flattered. They flattened alarmingly when I tipped them out so I scored super quickly. For some reason the blade didn’t drag on the dough this time; it’s always a bit hit and miss though. I know most people like to eat their bread newly baked but maybe I am a bit eccentric in that I like it when the sourdough firms up just a little and sort of settles down, it’s easier to slice too. This is not a definitive answer, just an observation. When you say your semola had a sandy texture, that suggests that it is not very finely milled. The equivalent roughly of maize cornmeal. Here in Italy, we get grano duro (that is Durum Wheat) either ground as fine as flour (0 or 00) or else a little coarser, like yours. That is often called Semola, and sometimes Semolina. My fine farina di grano duro (a named variety, no less) bakes up blissfully and does not damage the gluten at all. Either way, the loaves look great. Hey Jeremy, I have pretty much given up trying to source something finer than this. This bag is packed in Italy, brand or mill, Molino Bordignon, from an italian importer Licata, in Bristol. I’ve changed the picture in the post to show you better. It says for pasta and bread and it has a helpful picture of a loaf of bread on the front. This is finer than the ‘fine semolina’ I get in the supermarket here and finer by far than cornmeal, though we are not too expert on cornmeal in the UK either….. But without running my fingers through your semola (wink) I will never know …. Ah, Licata; now that brings back memories. I’d mail you a kg of mine — I get it in 5kg bags here http://www.saporideisassi.it/279-semola-rimacinata-di-grano-duro-senatore-cappelli-5kg.html — but that would be prohibitively expensive. Anyway, the point is that it is “remacinato” i.e. milled twice, which makes it finer. And by the way, the commenter over on the other forum is mistaken about 00. It is a grade that represents the fineness of the flour, being finer than 0. There’s nothing specific about the wheat from which the flour is made. You can get hard (i.e. high protein, or Manitoba) and soft (i.e. tenero) in 0 or 00. 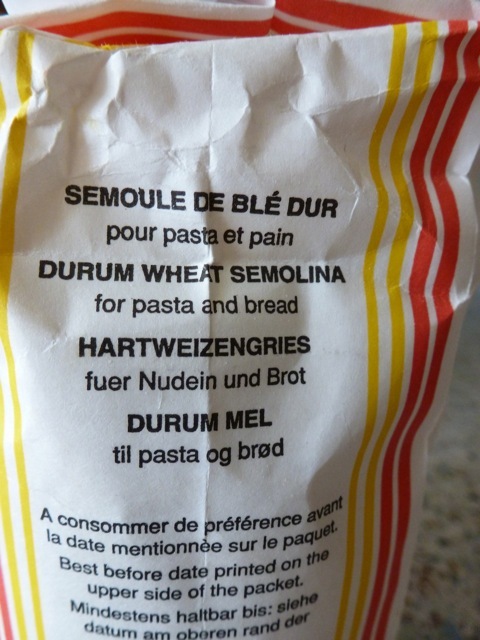 The tricky part, I guess, is that “hard” and “duro” or “durum” do not mean the same thing at all, referring to different kinds of wheat. I could go on and on, but this surely already more than anyone would like to know,. My advice, just go for the finest rimacinato you can find. How odd; there seems to be some sort of limit to the depth of threading of replies. Anyway, Licata, yes. I lived in Bristol and environs for about 20 years, and I remember it very fondly. I put a limit on, as the way the theme works, the replies get narrower and narrower and you end up with lines of a couple of words in length. If I was html/css sheet literate I would be brave and customise the theme. Licata and St Marks Road in Easton are two of my favourite places for supplies. We also have a huge pan-Asian supermarket behind Eastville market. The one that used to be by Montpelier station expanded and moved to a new building. There are some new bakeries on the Gloucester Road too. Yes you and Jeremy (see below) have some good flours, aren’t you lucky? I wonder if the stuff that Jeffrey Hamelman has at King Arthur Flour is the remacinato? That was really what I was wondering. If we are baking his recipes then that is the thing that is useful to know. Before I started reading the post and saw the first picture, I thought you had put in a picture of a loaf from a bakery. It looks so professional and perfect! It is definitely confusing when you start reading about semolina flour and trying to figure out just what stuff you need. Your semolina definitely looks finer than what I have. If I make this bread I will be reducing the semolina and only using a third of what the recipe calls for, since what I have is not the fine durum flour. Do you always use a linen liner in your banneton? Just wondered since I’ll be trying mine soon. I don’t have a liner yet, and I wasn’t sure if I needed one or not. Sometimes the photos make the breads look more glamorous than they are really, the effect of the close up. Thanks for the nice words Mel :) As you can see from my ingredient list I used far less than called for too as I was pretty sure the stuff I had wasn’t fine enough. On bannetons, what sort do you have? is it a cane one with ridges inside or a wicker one, or made of something else. If it is a cane one then you don’t need a liner. You dust the banneton inside with depending on who you listen to, fine rye flour, rice flour, or potato flour. I personally use fine rye flour usually. I have a couple of French ones which are made of wicker and they have stitched in linen liners. They get dusted with flour too before the dough goes in. Ah, the confusion of flour. I have to admit to not attempting to follow recipes that require me to source specific flours, but I’m sure that at some point I’ll come across this difficulty! Your bread looks as beautiful as ever – I love the slashed pattern on the sort of leaf one – very pretty indeed. This bread looks heavenly. How can you resist eating the whole loaf as soon as it comes out of the oven? Once again, gorgeous loaves, Joanna. I don’t know how you can leave them 2-3 days, though. Decent bread never lasts long at all in this house and I can’t just blame the kids for it. Sourcing different flours is a bit of an issue for me too, as I found out when I had to go to 4 different stores before finding rye flour last week. We are a two person household, so a lot of the bread gets frozen or given away. The sourcing of flour is one of those things. Rye flour is always a bit tricky, not that many stores stock it here, though more than used to with the upsurge of interest in home baking generally. Some weeks we eat more bread than others, but probably not as much as it seems from the blog. Thanks for the compliment Amanda! Joanna that top photo as everyone else has said is perfect. Little Monkey saw it and said “OOOOooo” (that was a compliment :-) Perfect slashes. Thank you sweetheart, I wasn’t expecting the slashes to work as the dough was so soft and spreading madly. 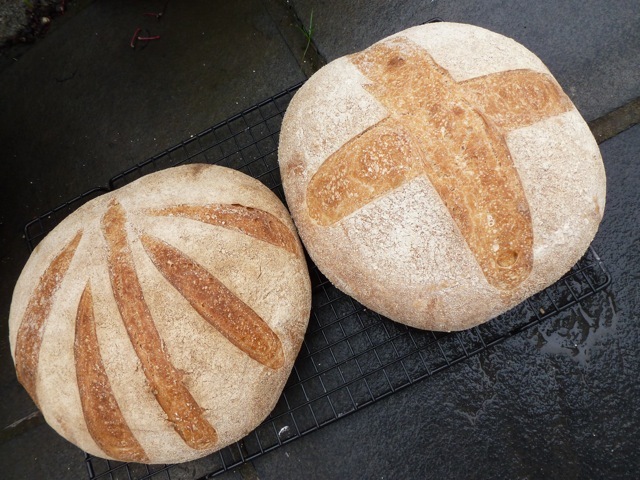 Usually I do a lozenge type slash on those round loaves but I thought maybe that pattern would be quicker…. I was pleased with how it came out too! We have been having summer downpours lately, it’s Wimbledon Week, nearly always some weather drama this time of year. That paving is just outside the kitchen door, I was trying to find a bit of natural light, the bread looks better than under the kitchen low energy lights which tend to cast a blue hue over everything. I have a new camera (old one got very ill) and I haven’t got round to reading the manual, so it’s all a bit hit and miss.